One year subscription to Jr High, High School, and Collegiate information in the state of New York. Includes complete general school information and coaches information including emails. No shipping fees, and no wait like other annually updated reference books. 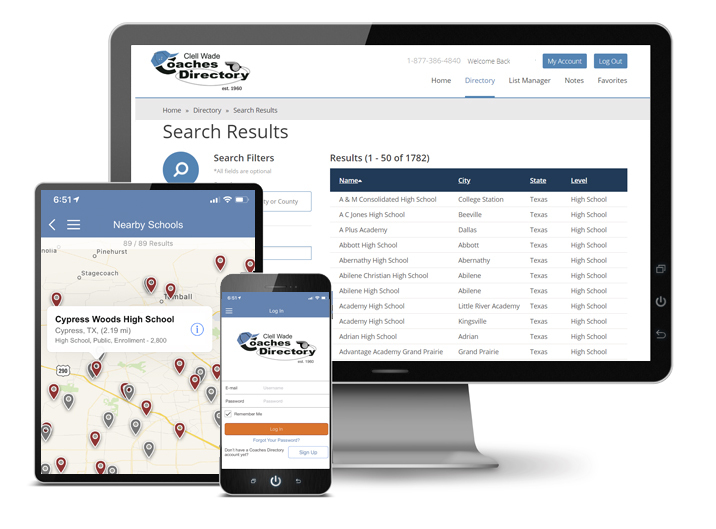 Access to contact information of Administrators, Athletic Staff, Band Directors, and more. Map features--map the exact location of the school. Clickable emails on contacts and websites for schools. Fee-free upgrades throughout the year. Free Mobile Apps for on-the-go access! Access using your iPhone or Android app! Copyright © 2019 Clell Wade - Coaches Directory Inc. All Rights Reserved.